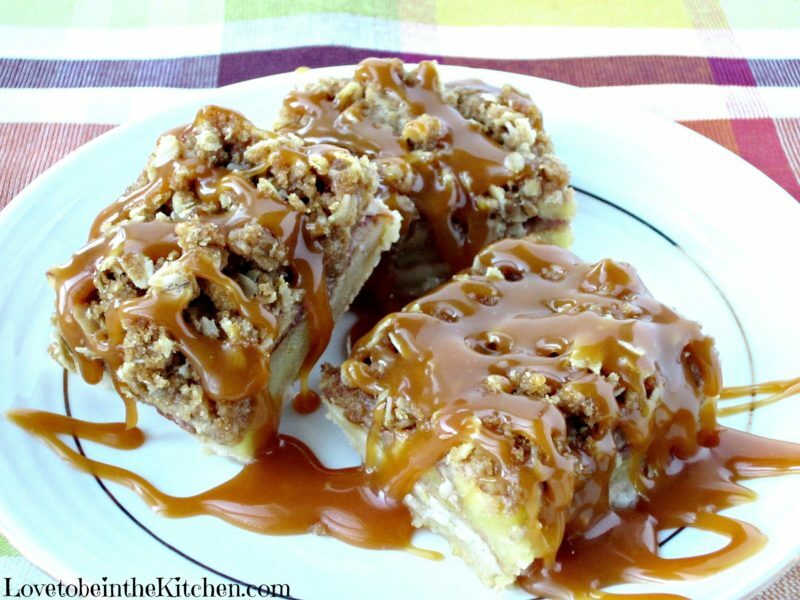 Salted Caramel Apple Pie Bars are quicker and tastier than apple pie! A buttery crust, topped with apples tossed with cinnamon, then sprinkled with streusel. A delicious drizzle of homemade salted caramel is added to make this dessert even more amazing! If you make one dessert this fall you have got to make this recipe!! 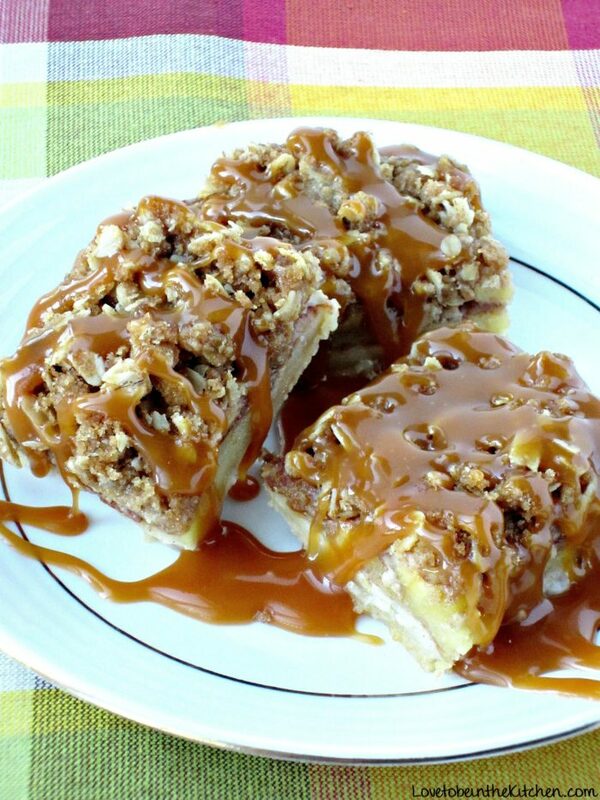 These Salted Caramel Apple Pie Bars are beyond amazing. No joke, one of the best desserts I’ve ever had! The crazy thing about this recipe is it seems complicated. The recipe seems long but I was shocked how quick it was to make this! The longest part was slicing the apples. It was a cinch to put this together! I’m thinking this would be a perfect alternative to pie for Thanksgiving! It’s just like pie but SO much quicker! My friend and I each doubled this recipe and took it to a church event. You wouldn’t believe how many compliments we got and everyone wanted the recipe! I’m telling you this dessert is one of the best you’ll ever have! The layers in this desserts are perfect. A buttery crust, topped with apples tossed with cinnamon and a few other ingredients, then the perfect amount of streusel sprinkled on top. Then to take this dessert to another level you drizzle homemade salted caramel on top! It’s outstanding! I’ve attempted making caramel before and have failed so I was nervous this time but was pleasantly surprised how easy it was to make and how perfect and tasty it turned out! Here is the recipe for the Homemade Salted Caramel. You will love how simple it is to make this dessert and how outstanding it tastes! Everyone you share it with will think you are a rockstar in the kitchen! Stir the melted butter, granulated sugar, vanilla, and salt together in a medium bowl. Add the flour and stir until combined. Press the mixture evenly into the prepared baking pan. Bake for 15 minutes. Mix together the oats, brown sugar, cinnamon, and flour together in a medium bowl. Cut in the chilled butter with a pastry blender or two knives (or even with your hands) until the mixture resembles coarse crumbs. Set aside. Remove the crust from the oven, and turn the oven up to 350F degrees. Evenly layer the apples on top of the warm crust. Layer them tightly and press down to fit. Sprinkle the apple layer with streusel and bake for 30–35 minutes or until the streusel is golden brown. Remove from the oven and allow to cool for at least 20 minutes at room temperature, then chill in the refrigerator for at least 2 hours. Lift the foil out of the pan using the overhang on the sides and cut into bars. Once cut, pour salted caramel sauce on top. Enjoy these apple pie bars warm or cold. The bars will stay fresh in an airtight container in the refrigerator for 3 days or frozen up to 3 months - thaw overnight in the fridge, then drizzle with salted caramel before serving. *I recommend using 2 types of apple, half a tart variety like Granny Smith and half a sweeter variety. **Recipe may easily be doubled and baked in a 9x13 pan. Bake for about 35-40 minutes. « Stampin’ Up! Frightful Wreath Kit Giveaway! These look so delicious! Perfect fall treat. My mouth is watering over here! I’m definitely going to making these this fall. Pinned! Thanks Alli! You are going to love these!